North Table Mountain Park, Jefferson County, Colorado. Lower east slopes of North Table Mountain, along the North Table Loop north of the Mesa Top Trail, 1.2 km. northwest of the Easley Road trailhead; 4.32 km. northeast of the GNIS location of Golden. 39.789°N, 105.1953°W. WGS 1984 Elev. 1829 m. Trailside in small outcrop of rocks. Coll. No. 1519, 29 Jul 2016, characters observed: Perennial herb, to 35 cm. 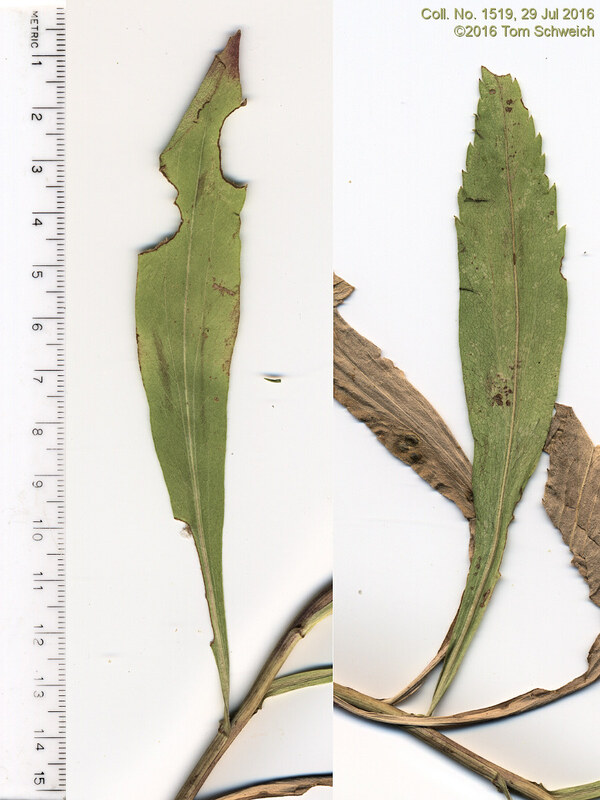 ; Leaves, basal, unknown, cauline, alternate, petiole 10 mm. + blade 100 mm. × 22 mm. wide, oblanceolate, glabrous, margin, sparsely scabrous proximally, serrate distally, prominently 3(5)-nerved, reduced above; Heads, 3-4 mm. × 3-4 mm. wide; Phyllaries, 3+ series, 3.5 mm. × 1 mm. wide, green, margin chartaceous, veins, 1; Receptacle, epaleate, conic, Flowers, 2 kinds; Ray flowers, #12, yellow; Disk flowers, #12, yellow; Pappus, capillary bristles. Field Notes: Coll. No. 1519, 29 Jul 2016.